Ever since our first trip visiting the museum has only gotten better. The staff there are very passionate about Disney and the unique part of history they captured in their little town. This visit we were visiting to see the new exhibit “What the Collectors Collect” and most importantly to attend the speaker series featuring animator Floyd Norman! It was a fun trip and the longest time we have spent in the town. We arrived in Marceline, and as we were armed with the knowledge that it was going to be a hot day, we decided to visit the outdoor sites first. First stop was the Disney Farm which is where the Dreaming Tree and Walt’s Barn are located. The barn is quite a site to behold. Nestled among wildflowers and small trees it is an unassuming structure both outside and in save for the hundreds, if not thousands of signatures, pictures, and notes from visitors to the town on the walls and beams. Marceline’s Kansas Ave (as many might know) is one of the main inspirations for Main Street U.S.A at Disneyland. It has changed greatly since Walt’s days but the town is still proud of this heritage as seen in on the light pole. Since it was hot we were excited to visit our favorite ice cream place, Yummiez, however it has closed since out last visit! Definitely disappointed but we moved onward. Next stop was the Elementary school whose flagpole was originally located at the 1960 Winter Olympics in Squaw Valley CA where Walt was involved in putting on the opening and closing ceremonies. Next, we drove through the Disney Park to see what was there. At this time there isn’t much to see that you wouldn’t see at any other park. This used to be the location of the Midget Autopia before it was dismantled. Walt gifted the ride to the town and it operated for over twenty years and was the only Disney ride to operate outside of the parks. The Hometown Museum is trying to bring back the Midget Autopia so we hope this happens! We made our way back down town and headed to the museum. It was time to take in the new exhibits and we were very excited. We were most excited to see the new exhibit, What the Collectors Collect. We left this first room and made out way through the rest of the museum seeing the other great items and murals that are among their offerings. There were many letters from Walt to his sister Ruth talking about the latest projects. This is one of the best talking about completing Summer Magic, the Swiss Family Robinson Tree House, and the Enchanted Tiki Room! Throughout the company’s history the letter head featured the latest film of the time. One of the great original murals by the artist ARCY. A great talent that uses spray paint in amazing ways. Check out his page here. Also in this room are the models of Disneyland all made by Dale Varner. Also in this room is Walt’s original light table from Laugh O Gram Studios which was lent to the museum. Very cool! We had seen so many great things so far and at this point we were starving! We left the museum and walked through E.P. Ripley park and went to a local place Ma Vic’s Cafe. We got burgers but they were so delicious that we ate them without taking any photos! Laura did get a photo of the desert we got called a “Dusty Miller”. Basically an ice cream sundae with layers of vanilla ice cream, chocolate syrup, marshmallow fluff, and malt. It was delicious as well and we were very pleased with our meal. Now it was time for the Floyd Norman talk! We were beyond excited and the entire experience was sort of surreal. Floyd was a no frills kind of person and merely strolled in through the front door like everyone else. I practically ran into him and his wife after coming out of the bathroom before the talk began! We were less than 15 ft from a Disney Legend! Floyd was great to say the least. He was so great to listen to and has had an amazing career in animation and storytelling. He has done so much working on great Disney and Pixar projects such as Sleeping Beauty, 101 Dalmatians, Jungle Book, Toy Story 2, and Monsters Inc. He is still working for Disney on various projects and hasn’t slowed down even have any decades in the business. You could tell as he recounted stories of working on films, interacting with other animators, and even Walt himself, that he truly loved what he did and still does. It was great to see his perspective on the company and story telling in general. He also talked about some projects that he worked on that never came to be including a project called Wild Life which was about anthropomorphic animals in their own city and another which seemed to be an undead western, about the afterlife with skeletons and such. The talk was over after a brief round of questions and it was time to head back to the museum for the reception. We enjoyed some great appetizers and drinks as we discussed the talk and waited around to get a chance to meet Floyd. After quite a while with him not showing up in the reception area we decided to wander around to see if he was in another room. We walked into the museum main entrance and store and there he was! We had brought his documentary so he could sign the sleeve as we met him. He was so humble, and as he autographed the DVD he talked about how great the artist for the cover was, and how great the film makers were and how honored he was to work with them! We were lucky that when we met him no one was behind us so we could take a few minutes to talk to him. We took a picture with our Fujifilm Instax camera and he loved the Polaroid style instant photo. He was glad to see they had made a come back and said that when he first went to Disneyland in 1955 he took photos with his Polaroid camera that he still had! He also talked about the changing mediums with which stories are told and how technology was changing things. So great and interesting to hear his perspective. Well needless to say this was a great trip to Marceline. A great museum, fun little town, and so wonderful to meet Floyd Norman. If you are interested in learning more about Floyd you should check out the documentary about his life called Floyd Norman: An Animated Life. You can purchase it online and it is currently available on Netflix. 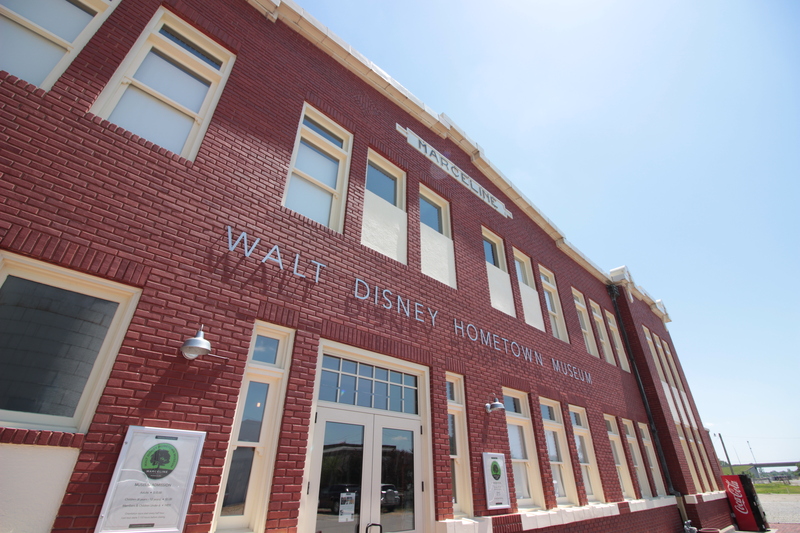 If you’re within a day trip to Marceline, I highly encourage you to make the trek out and visit the Walt Disney Hometown Museum, especially before the season closes in October so you can see the What the Collectors Collect exhibit. We appreciate you taking the time to check out the blog and read this post and hope you found something you enjoyed!